O. Commowick, N. Wiest-Daesslé and S. Prima. We propose an iterative two-step method to compute a dif- feomorphic non-rigid transformation between images of anatomical structures with rigid parts, without any user intervention or prior knowledge on the image intensities. First we compute spatially sparse, locally op- timal rigid transformations between the two images using a new block matching strategy and an efficient numerical optimiser (BOBYQA). Then we derive a dense, regularised velocity field based on these local trans- formations using matrix logarithms and M-smoothing. These two steps are iterated until convergence and the final diffeomorphic transformation is defined as the exponential of the accumulated velocity field. 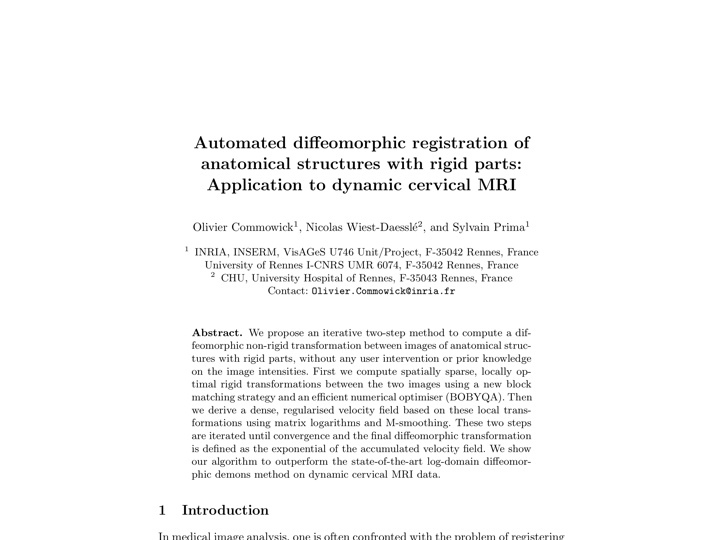 We show our algorithm to outperform the state-of-the-art log-domain diffeomorphic demons method on dynamic cervical MRI data.